Why don't we do it in the...front yard?!?! 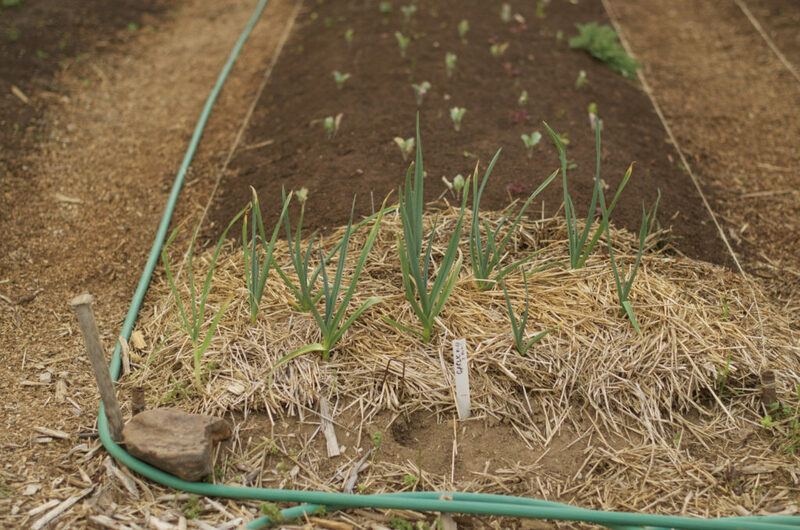 One of my favorite Permaculture principles is about planting specific “crops” in specific zones for proximity of convenience. For example, you grow your kitchen garden herbs and veggies as close to the kitchen door as you can, so you can step out, gather them, and cook. Also, the things that require the most maintenance, in my case, okra, would be somewhere you would encounter them most often. For me, that’s right outside the front door, where I am passing by to go to the mailbox and the car on a daily basis. Because I am basically disorganized, I need my work in my face to have any hope of getting it done. That okra needs to be monitored daily; the pods get too big and tough – overnight, it seems. My 3/4 acre lot slopes down from behind the house to the road, the steepest, bottom-most part of which was planted back in the ’60s with a large patch of juniper, innocuous enough if not beautiful, but also not productive. Six years ago we put a couple raised box beds on the flattest part of the front yard which is down 4 steps from the front porch, on driveway level. 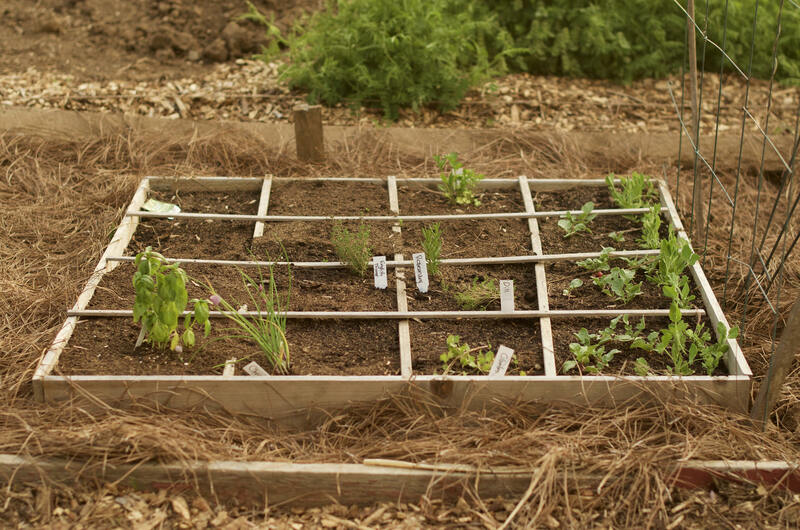 I used Square Foot Gardening to get started. The next year we added another box, then two more the 3rd year, as well as the beginnings of an orchard. The 4th year we moved a stump out of the small back yard and doubled our bed space. Last year I hired Ben Portwood to dig that 100+’ long x 20′ deep patch of juniper out and plant the beginnings of a Permaculture food forest, filled with 40 fruit and nut plantings, cover-cropped with buckwheat, clover and wildflowers to grow in turn. The wildflowers are just starting to show. Because my home faces south, the primo feng shui and passive solar position, my large living room windows face the front yard which once featured mostly non-edible landscaping, but is now mostly edible. I can spy a newly-ripe tomato as I’m walking from the bedroom to the kitchen. That okra is one of the prettiest plants in the whole yard – a stand of it is magnificent! When the rhubarb needs harvesting, it beckons. I’m hoping that when the deer, bunnies, turkeys and bears – and humans – go by, they’ll find a bite to eat – I don’t mind sharing. And there are other advantages, I’ve learned. Throughout this process, people/neighbors have stopped while walking or driving by, to comment, ask or admire. Some have received a handful of sugar snaps, tomatoes or a squash or two, whatever I’m working on at the moment they pass. We catch up. I’ve made some new connections. Many of them have told me that they’d thought about gardening out front, but thought it might seem tacky, or bother their neighbors. They can see from my example that it just isn’t so. And in that conversation, I can plug OGS and its wonderful educational opportunities. 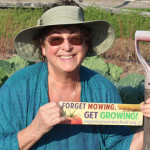 I see front yard gardens all over Asheville as I cruise, and someone else on my street is getting ready to put in a front yard garden – it’s a movement! And it’s beautiful. And cool. It says, I grow food and I’m proud of it. I just signed a petition and wrote to the mayor of a Missouri town where local regulations are pressuring a family to dig out its organic garden because it’s in the front yard. I really feel for these folks, and they’re not the first ones to have to defend their garden plots, according to the article. During WWII it was patriotic to have a vegetable (Victory) garden, and folks did it wherever they had enough sun. We know that home growing is a way to bodily, environmental and family health. You can’t do it where the sun don’t shine… so if your front yard is the sunnyside, do it, and if it’s not… grow front yard mushrooms. Make a statement. Make a front yard garden. You’ll be proud you did. I am.